Using conceptually linked images is also a great way to introduce new concepts and to enhance related information, making it easier for learners to digest and memorise. Note: Before you begin creating your Drop Tab Template, you’ll need to prepare your image or images. You’ll need to adjust the size of your images depending on how many you want in your template. A width of 1100 pixels works best for one image, 550 pixels is best for two, around 360 pixels is best for three images, 275 pixels works well for four images, and 220 pixels is optimal for five images. Step 1: Select the Drop Tab Template from the ‘Presentation’ panel. Step 2: Drag your Drop Tab Template into the Lesson Pathway. 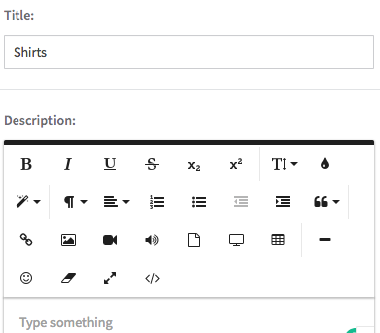 Step 6: To start building your Drop Tab Template, select the green ‘Add New Item’ button. Step 7: Choose your image and enter a description for it. For more information on using the ‘Add Image’ button, click here. 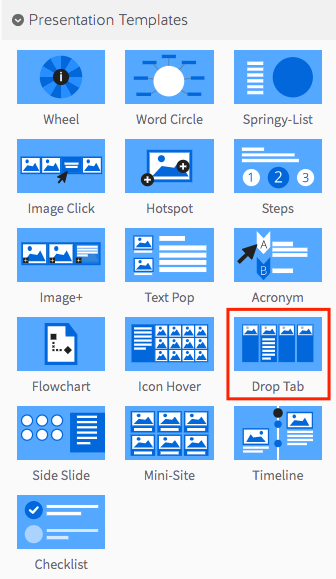 Image Tips: Choosing your image sizes for the Drop Tab Template depends on how many images you’d like to display. For 2 images, try sizes of 280 x 200 pixels. For 3, try 260 x 190 pixels. For 4, try 220 x 150 pixels. For 5, try 180 x 120 pixels. For 6, try 165 x 112 pixels. Step 8: When you’re done adding your image and text, select the green checkmark to save your changes.